Kuala Lumpur is one of the most colorful and busy metropolises in South-East Asia. The fact that the city is very multi-cultural, mixing many peoples, customs, cuisines and so on make it an amazing place to visit. With this Asaptickets offer you can fly to the Malaysian capital from only $1175. No matter if you come to the city for business or for a getaway, you will love the liveliness of the streets and the hospitality of the people. If you have some time, visit the crowded, vivid and amazing Central Market and do not miss the Kuala Lumpur’s famous landmark, the Petronas Twin Towers. But be quick, you have to book by August 15, before the deal expires!! You can save up to $50 on these discount flights, so you might not want to miss the opportunity. Fly on weekdays from Monday to Wednesday to get the best rates and keep in mind that some of the fares may require a minimum or a maximum stay. Below you may see a few examples of the fares included in the offer. 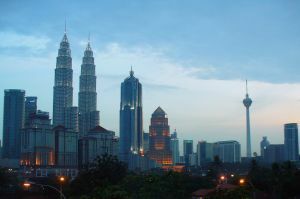 The flights listed depart from Los Angeles International Airport (LAX) and arrive to Kuala Lumpur International Airport (KUL) but there are many other departure cities available. The prices below include all taxes and fees apart from airline baggage fees. This entry was posted on Friday, August 12th, 2011 at 4:05 am and is filed under Airfare Deals. You can follow any responses to this entry through the RSS 2.0 feed. You can leave a response, or trackback from your own site.